What is Filtered Sound Training (FST)? On 16th June 2014 Dr Guy Bérard died at the age of 98, attended by his wife Nicole, and his physician. He lived in Les Ollieres, in the region Haute-Savoie, France, in the foothills of the Alps. So, quietly, passed a man who contributed greatly to the well-being of many people in his medical practice. But it is especially as the originator of the method he named ‘Auditory Integration Training’ that he will be remembered. By his own account, he went to work in Indochina / Cambodia as a medical doctor since there were few opportunities available in France at the time. He reports being strongly influenced in his approach to his patients by his assistant who advised him not to talk so much to the patients, just fix them! He brought this philosophy into all he did, being an immensely practical man who physically built his own clinic with his own hands. Dr Bérard recounts how he returned to France from time to time to take a number of further specialisations, notably in Otorhinolaryngology (ENT) surgery. 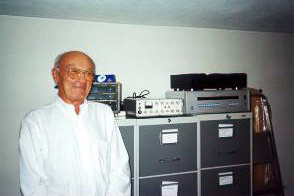 Around this time, he met Dr Alfred de Tomatis whose work with modified music and sound to retrain the ear and psyche had been in operation for some years. Dr Bérard joined Tomatis’ clinic, but it soon became apparent that these two thinkers were pursuing opposing concepts: Tomatis the emotional/psychiatric, and Bérard the practical/ mechanical one. Since he was not silent in his opinions he soon found himself ‘set free’ to continue developing his own method, which we now know as AIT (or FST). Thanks to the huge efforts of Annabel Stehli and her husband, Peter, who formed the Georgiana Organisation to promote AIT, Dr Bérard was brought to the USA to train practitioners. When I travelled from Cape Town, South Africa, in May 1994 to be trained by him he was 78 years old. I was struck by his immense wiry energy, his fitness, and sense of humour. I recall how after a full day of teaching in Westport, Connecticut, USA, he arranged a pair of bicycles with Peter Stehli’s help, because he needed to get out and moving. Peter told me he would travel anywhere he would be allowed to scuba! Didn’t he break his collarbone skiing at the age of 88? In 1999, after I had developed the Earducator in South Africa, I took it to him in his villa in Annecy (Les Ollieres), to seek his approval/comment. He was a gracious host, and he and Nicole treated me to a wonderful meal overlooking the Lac d’Annecy with its ‘fete du Lac’ fireworks show. He was then still as sharp and as fit as ever. Today we can list centres all around the world offering AIT, from the UK and Ireland to South Africa, from the USA and Canada to Indonesia and China. In many different countries and in many different languages, children and adults with disorders relating to listening and integration are being helped to live more competent lives. Over a million people worldwide owe a grateful acknowledgement to this man. He leaves a legacy of dedicated practitioners, who are faithful to his protocol, and some who continue to develop his protocol to make it even more accessible to a wider range of people. I have been always guided by his strong conviction that we need to not place impossible burdens on the children or their parents, e.g. by unnecessary expense, or unnecessary testing. But above all as a practitioner I valued his approach to the support of practitioners: – whereas similar auditory methods make their practitioners pay huge sums to maintain their licenses, Guy Bérard set us free to pursue our practices as our wit and energy took us. He was always there with advice and counsel: – he used to describe the ‘white river’ of faxes pouring into his office daily. He always answered them. So, we honour a great man, whose life’s work has made an indelible mark on the landscape of assessment and intervention. Copyright © 2018 Filtered Sound Training. All Rights Reserved. Website Design by Digital Takeover.